We at Hidden Hills Farm absolutely love what Caezar brings to the table. 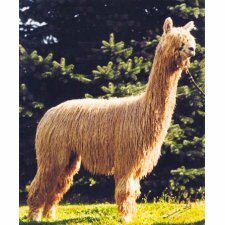 His crias have been among our finest lights produced here to date. 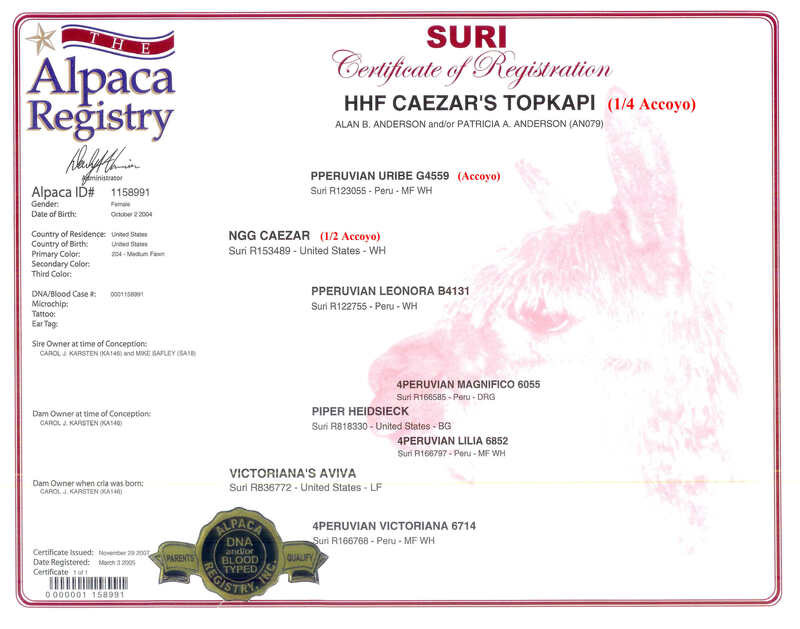 His light fawn daughter, HHF Caezar's Topkapi, has produced a color champion gray daughter for Topkapi's owners, Wild Rose Suri Ranch, who bought Topkapi from us with that cria on board. In 2009, our dark brown female, Mildred, presented us with a dark fawn female, Mapuchea, who is just amazing. We love the work of this hallmark Accoyo/Alianza male. 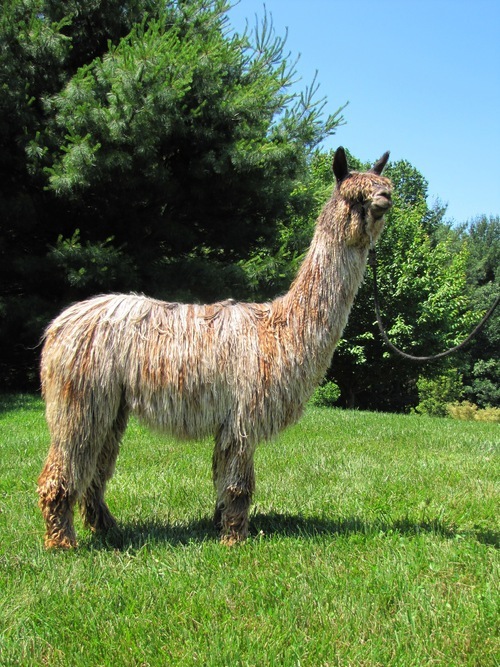 Aviva is simply a beautiful, full Peruvian suri alpaca with top show-ring credentials and proven ability to produce show-quality colored offspring. 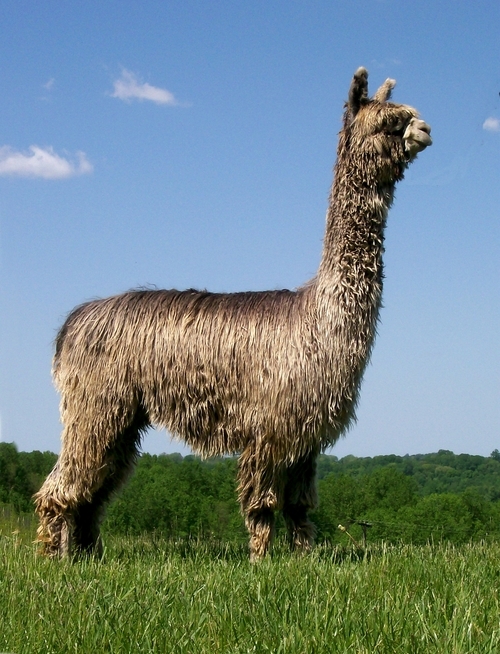 As a juvenile, she took the Light Suri Female Color Champion honors at North American Alpaca Show in 2003. Aviva has dark toenails and dark pigmentation around her eyes and muzzle -- I am sure it helps a bit, too, that her grandsire was dark rose gray 4P Magnifico (now deceased). Her first cria, sired by the well-known NGG Caezar, is Topkapi, who is now owned by Patti and Alan Anderson of Wild Rose Suris. Bred to our Reserve Champion solid rose gray Gunsmoke son, Winchester Steel, Aviva produced 4 phenomenal appaloosa crias with a base coat of SOLID LIGHT SILVER GRAY . 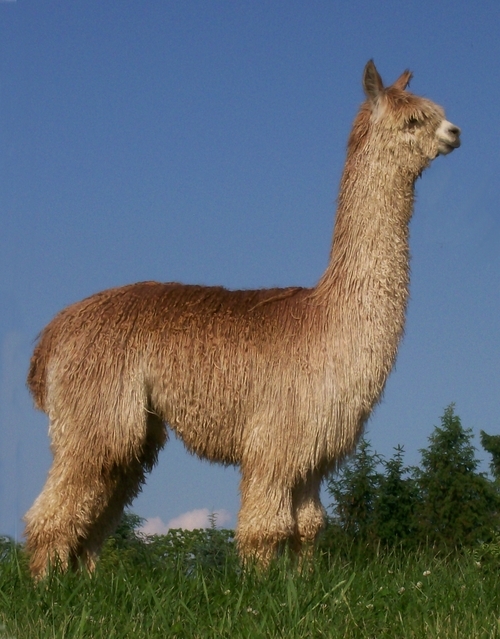 We knew Aviva had color in her lineage that, properly bred, would see the light of day, and we are thrilled with Western Sunrise, her fall 2005 cria. Of course, Aviva was bred right back to Winchester. In fall 2006, she produced a solid dark silver gray male with a dark face -- same stunning luster, same pizzazz as his lovely sister. We call him The Rifleman. Topkapi, or "Kapi" as we call her, comes from a line that can produce beautiful grey suris. Topkapi's dam line is as strong as her sire line -- she is a NGG Caezar daughter, after all. 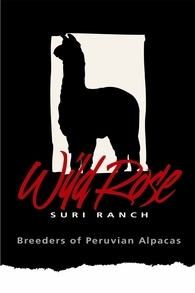 Her maternal grand dam was one of the top 1996 Peruvian lottery import picks and has produced champion and show-winning offspring year after year, from light fawn to true black in color. 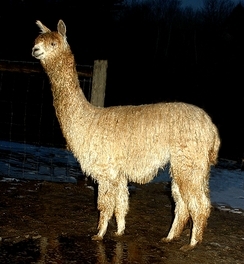 Her dam, Victoriana's Aviva, was the 2003 Light Female Color Champion at the North American Alpaca Show. Hidden Hills Farm only showed Topkapi twice and she did well both times in tough competition. Her conformation is superb, bite is correct and her luster and fineness is top of the line. Her fleece resembles molten gold. Moreover, her regrowth fleece is beautifully relocked each and every year. Kapi's first cria by Toni's Peruvian Winchester was a 3X fleece champion, Winchester's Wild Rose Patches, a beautiful slick dark silver grey female with outstanding production traits. Her 2nd cria was WRSR Mercury Rising's Marauder, another Champion this time in a Rose Grey male, who has himself sired multiple fine fleeced grey offspring. Her 3rd cria is WRSR Manzanita by Mercury Rising who is light fawn, but produced an appaloosa rose grey male by grey Hidden Hills The Rifleman. Color abounds! Kapi has been held open the past few years as we have significantly cut back on our breeding program. 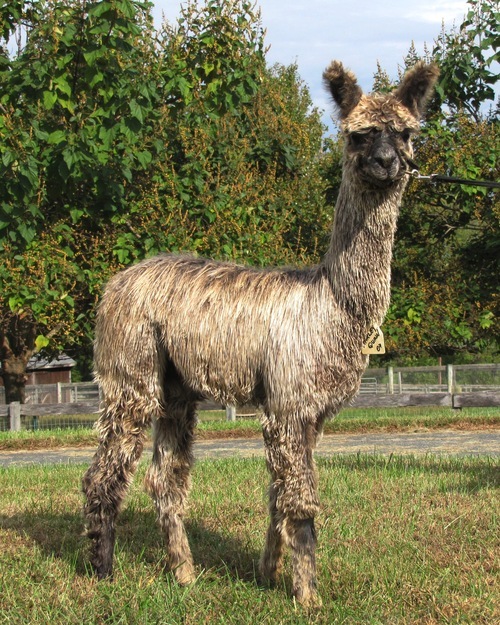 She was bred to Fusion, our big spotted grey/brown appaloosa male in and produced a beautiful harlequin male cria, "Harley Quinn", in August 2016. We are very pleased with the results! Be sure to check out his listing on our website. Kapi is being rebred to Fusion for another spectacular 2018 appaloosa cria! Contact Patti (443-740-4240) or email for more information and if you are interested in buying her. She is currently one of our foundation females but is available for sale to the right buyer.